It's no wonder that the exterior of burlesque club Proud Cabaret makes quite a few people think there is a connection with the Royal Pavilion. The ornate dome and Indian influenced styling is a clear nod to Brighton's most famous landmark. But it turns out that this was a private mausoleum for a wealthy family in 1892. The main house that the family owned further up the road has long gone, along with the er, former occupant's remains in 1933. Not sure what they would have made of the new bodies on show today, but there you go. Onwards, and upwards - which is exactly the attitude this place needed prior to the gorgeous refurbishment in 2011. I hadn't been back since my student days when it used to be the Hanbury Club for strange manga club nights illustrated with cheap booze and floppy haired DJs. Luckily things have smartened up and it is sumptuous inside, like a very intricate, naughty chocolate box. The booths are ideal you were dining with a group and with the exception of a few tables tucked into darkened corners, most offer a great view of the stage. This is a very tricky venue off the beaten track in Kemptown and I think they've done well to create something people will finally consider travelling 15 minutes from the centre for. I couldn't think of a more appropriate and beautiful venue and I've always had a soft spot for it. The theme of the night was murder - gasp! The Silencing of Miss Scarlett is a murder mystery drama, played throughout the evening. What I liked was that the action wasn't just contained to the stage and actors milled about in character during the intervals. There were also nice details like newspaper clippings of the murder on the tables to set the scene. Staff are lovely. The welcome was warm and I was quickly put at ease by my waitress, despite her scanty attire of stockings, corset and ostrich feathers. Although invited, I noticed every table was receiving the same attentive care during the meal and show. Everyone was friendly, professional and accommodating which in my book goes a long way. I also liked the diverse spectrum of people this club night clearly attracts. Groups of gorgeous girls all dressed up to the nines for a special occasion, couples, some in themed dress, some young and quite a few older couples too. There was even a work group in on a very, very late Christmas do. Better late than never, eh. If you have been to a few similar burlesque shows in London, you may find them a little more polished with perfect vintage starlet performers. The show here is sprinkled with a little Brighton magic if you like, more alternative with tattoos and piercings with a side order of camp and I did enjoy it. The compare isn't normally my cup of tea but he did have me giggling and was the right balance of anxiety inducing and entertainment. He only hauled one lady on stage but she was very much up for it. So to the food. I always find menus at cabaret shows a little kitch, heavy on the duck, 70s sauces, coulis and desserts in pots. I can't say I've ever enjoyed a meal that accompanies a show like this. 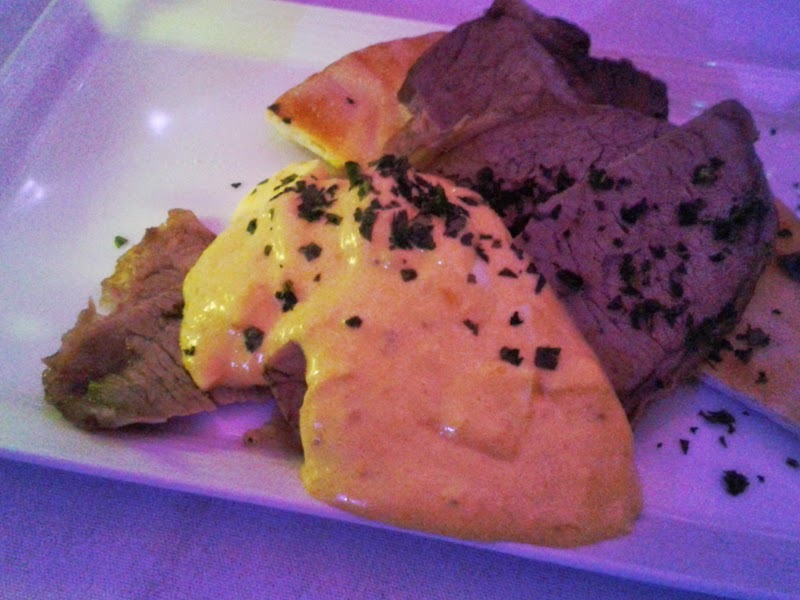 My meal was fine, I had an unusual starter of salt beef (I'd call what was served roast beef), naan with the classic eggy sauce gribiche. 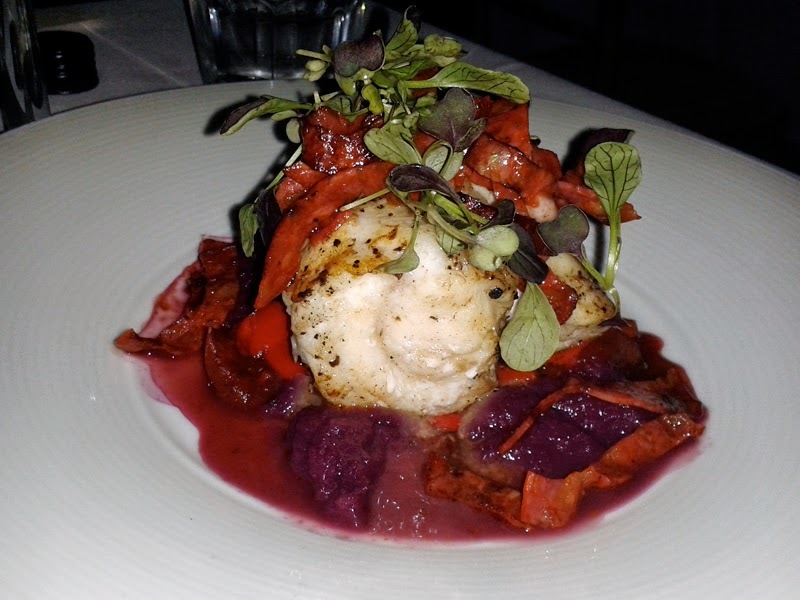 The monkfish main dish was overcooked but the sauce with Balsamic Sweet Peppers and Chorizo gave it acidy to pep up the dish and it did look attractive on the plate too. The dessert of Blackberry Parfait with Shortbread was again fine but over sweet for me. There are nice touches like cocktails served discreetly in teapots and cups to add to that speakeasy, prohibition vibe and everything is nicely presented. At the end of the day, the food isn't going to win too many awards but for this night (some of their others are a little more expensive), the show and dinner was just £25 which is great value. Most of the similar shows I've been to pitch in around the £60 dining and entertainment and the food was a similar quality level. Personally, if the food was better then they would tick all the boxes but I'd say 99% of people come along for entertainment and fun rather than a dining experience. I'm not sure anyone would book a table here purely for dinner what with the risk of flying tassels and undergarments. After the show the music is turned up until late. I'm returning with a group of girlfriends and feathers as soon as I can for another dose of vintage fun. Food and drinks were complimentary courtesy of Proud Cabaret.